This is a problem for those running projects as well as for those being asked to find and recruit people. They are asking the wrong questions or don’t have the relevant assessment tools at their disposal. The emergence and impact of practice that seeks a more reactive holistic approach is now unquestionable. That can only be gained from knowledge and above all knowhow. Experience. We need thinkers and doers. But in the one person. 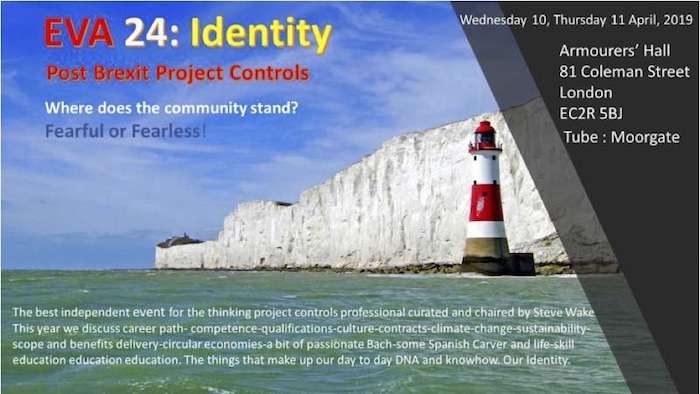 The project controls community exists. It still does not have a properly defined identity. There is no clear career path. The tribes need to be brought together. They all contribute in their own way to a larger perspective, a better understanding of what we need to do. The separations are becoming divisive and partisan. We cannot let that happen if we are to survive and thrive for ourselves and the greater public good. EVA is probably the only event where difference is not an issue. Where which Body of Knowledge or Method will force you in or out. They will also be very keen to set Project Controls onto a formal career path this year and are looking for like minds who will lobby for and champion this, as well as networking and business leads. Government Defence Aerospace Construction Utilities Transport Power Generation Pharmaceutical and IT sectors are represented. We always welcome support from organisations which cannot sponsor but can offer help in kind. We are happy to enter into contra agreements for mutual benefit. These workshops are generally organised in the day before or after the main 2 day event.